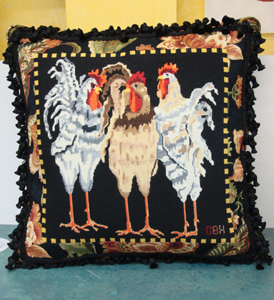 We have several local expert finishers that cover most needlepoint items. They finish pillows, Christmas stockings, Christmas stocking cuff, mini socks, mini skates, ornaments, 3 d mini houses, stand-ups, tote bag inserts, leather goods with inserts, lacquer box top inserts, tallis bags, eye glass cases, scissor cases, bean bag frogs, signs, brick covers, along with a variety of custom items such as bracelets, treasure boxes, unique purses, Eliza B. flip flops ,3D animals, picture frames, trays without frames, paper weights, coasters and magazine totes. Belt finishing is one of our many specialties. A basis leather finish is blocked; top stitched and comes with either a brass or chrome buckle. Hipster belts are gaining more popularity. They are gorgeous 2.5” width designs that wrap around your hips. They can be lined with a neutral shade of ultrasuede or leather with custom wooden or lacquer buckles. Other varieties of custom belt finishing are available: D-ring belt lined with grograin ribbon to slide belts lined with soft leather, dog collars and key fobs. We also offer a unique and special stitching service for those who do not know how to needlepoint or for those who just do not have the time. Let our stitchers take away the pressure to start or finish a treasured canvas. No project too small or too large. 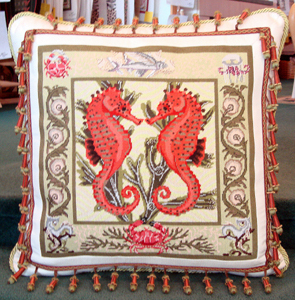 Feel free to call or come into Needlepoint Alley to get an estimated cost.